For the past 13 years, Beth Holloway has been working to increase the ranks of women in engineering at Purdue and beyond. Holloway has seen the dearth of female engineers firsthand. Early in her career, Holloway spent nine years as a mechanical engineer; nationwide, only 6 percent of mechanical engineers are women. 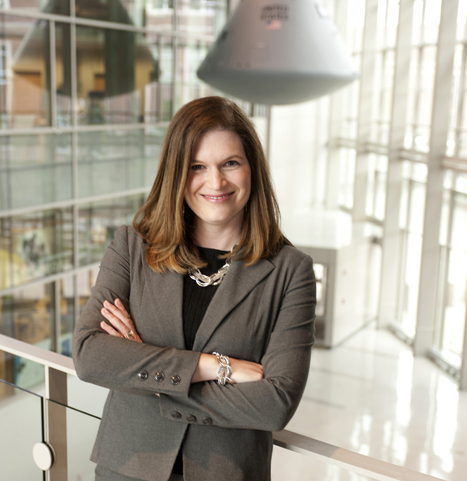 Now, as director of Purdue's Women in Engineering Program, Holloway uses her considerable insight and expertise to help draw more women to Purdue's College of Engineering -- and support them through their college careers and beyond. She also supports student success in general in her role as the college's assistant dean for undergraduate education. How did you first experience the lack of women in engineering? After I completed my undergraduate degree in mechanical engineering at Purdue, I went to work for Cummins Inc., a company that designs, manufactures, sells and services diesel engines and related technology. It's a great company, but like other engineering companies across the country, it has a real lack of female engineers. While I was at Cummins, I banded together with several co-workers who were also Purdue alumnae, and we worked to improve Cummins' recruitment and hiring of female engineers from Purdue. I also completed my master's degree in mechanical engineering during that time. When I learned that the director of the Women in Engineering Program was retiring, I realized that this was my dream job. I'm very passionate about getting more girls interested in engineering and recruiting more women into the profession. Why is it important for women to be represented in engineering? There are a lot of reasons, but a big one is this: A group with many different perspectives will always come up with better solutions to a problem than a homogenous group. As a problem increases in complexity, the likelihood of finding a solution increases as the diversity of the group increases. Engineering is full of complex problems, and so women's participation can help elevate the profession. Another argument is one of practicality. When you project the future demographics of the U.S. and you consider how many engineers we'll need, one group alone will not fill that need. To do so, we need more women and people of color to become engineers. There's also a social justice aspect to this issue. It's simply the right thing to do to have a more inclusive environment. Technology is a huge part of our society and it substantially affects everyone. Women should be part of the process of creating new technology so we can assure that new technology serves everyone’s needs. What are some details about the Women in Engineering Program? The program has existed since 1969, when several dedicated and enterprising faculty members in the Department of Freshmen Engineering saw a huge opportunity for women in the College of Engineering beyond its 1 percent female enrollment They started the program, which is now its own unit within the college. As a program, our mission is to enrich the profession of engineering through the full participation of women. We reach out to encourage and support all spectrums of girls and women, from children in kindergarten to college students to even some faculty members. Essentially, we try to spark girls' interest in engineering, nurture it and show them why Purdue is an excellent place to study engineering. Then, we create networks and communities that work to support our female students while they're undergraduates and graduate students. How does the program try to build girls' interest in engineering? We work to undermine some of the unconscious, societal reasons why girls don't consider engineering. To clarify, society has a lot of unconscious expectations for men and for women, and a lot of society’s perceptions of engineering line up better with the expectations society has for men. When we talk to girls about engineering, we use appealing and motivating language to try to supersede stereotypes. It turns out that when we describe engineering broadly -- that it's a teamwork-oriented discipline that makes a difference -- it's very appealing to everyone, regardless of gender. Right now at Purdue, the College of Engineering's enrollment is 23 percent female. That's better than the national percentage, which is 19.5 percent, but there is still a lot of room to improve. I'm excited to continuing to work on this very important issue -- and to see what the future will hold.